After a great panic and utter bewilderment, calm has been restored … my wonderful daughter spent much of her precious Sunday working generously and diligently on the “THTT Restoration Project”. So, thanks to my daughter and the beauty of technology and communications working in harmony over great distance, we are now able to see the right hand side of the blog again. Who knows how it disappeared? A mystery … but such relief to have it back again. Now we are into February and, despite having registered “The Holly Tree Tales” exactly one month ago today, not much has been built wordwise and I continue to dabble with the basics of structure. This is probably going to be an ongoing process, as one becomes more and more familiar with the blogging machine and its thought patterns – all still Greek to me. Am going to practise posting another photo and see it if works for me today … (still haven’t figured out how to see the caption that I have typed into the blog’s brain somewhere). The tour and the journey continues. PS. 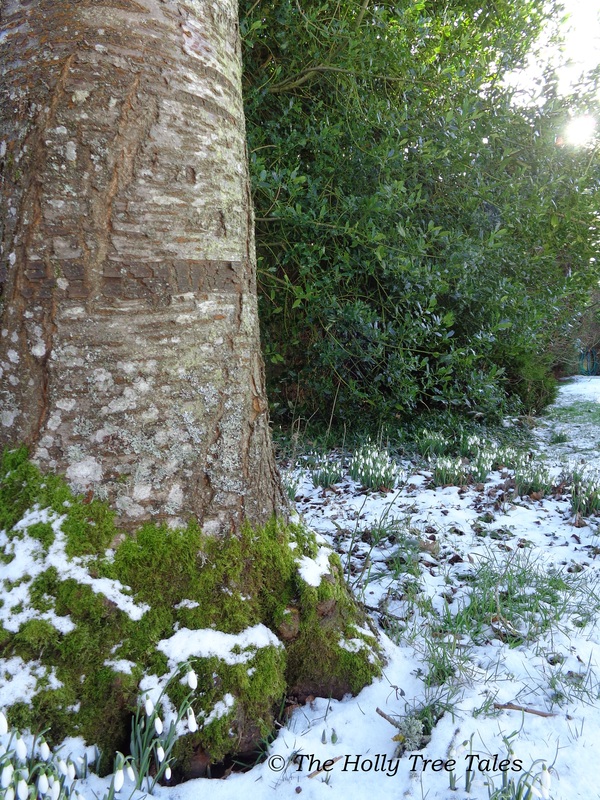 The photo below was taken in my organic garden yesterday, Sunday 1 February 2015 … Moss, snow and snowdrops under a cherry tree, with holly in the background.